Leading wind lidar provider, ZephIR Lidar, has released the single most comprehensive set of results across the industry to date totalling some 79 separate, non-concurrent validations. 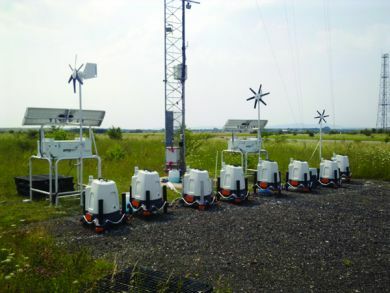 All ZephIR 300s were validated against an IEC compliant 91m met mast, at the UKs Lidar & Sodar Test Site (UK-LSTS). The purpose of the validations is to verify that the product design, engineering and manufacturing delivers a consistently quality product allowing ZephIR Lidars Quality Assurance process to confirm the required corresponding met mast measurements over a range of heights above ground level. The 79 ZephIR 300s all successfully passed the set of performance verification criteria devised in collaboration with GL Garrad Hassan requiring the gradient of the regression line forced through the origin of the 10-min averaged horizontal wind speeds to be within ±2% of the ideal value of unity. In addition, the coefficient of determination, R-sq, a measure of the scatter of the data for which the value 1.00 indicates perfect correlation, is required to be greater than 0.97, at all four matching measurement heights (91m, 70m, 45m and 20m). More importantly, a statistical analysis of the combined results showed the forced-fit gradients across all 79 trials had a standard deviation of less than 1%. In more than 64% of the ZephIR 300 trials, the gradient was actually within ±0.5% from the mast results, providing strong evidence of the consistency of ZephIR 300 performance (Figure 2).